Over a year ago, I went with my sister to visit friends in Virginia who live not far from the Blueridge Parkway. One rainy day we drove up the parkway to have dinner at the Mabry Mill Restaurant which is at an old historical mill in the area where grains were ground using water power from a nearby stream. There were lots of other community events that took place there too as well. During part of the year there are demonstrations of some of those activities which include blacksmithing, apple butter making, chair caning, basket weaving, spinning and weaving yarn and woodworking. However, on the day we first visited it was raining and nothing was happening outside. We did walk around looking at some of the structures that were used to divert the water to drive the grindstones of the mill which were impressive and we saw some of the setups for the the other demonstrations. However our goal that day was to have dinner there and of special interest to me were the pancakes which they serve any time. Originally I assume the pancakes were made from grains ground there and so they try to honor that tradition. After looking over the menu since I couldn’t decide whether to choose corn, buckwheat or sweet potato pancakes, I chose the three stack which had one of each kind. I thought I would like the buckwheat the best as I remembered having them growing up. However, the buckwheat I remembered from my childhood must have been a milder blend containing less buckwheat because their buckwheat pancakes had a strong buckwheat flavor. I enjoyed all of them, but surprising to me the sweet potato was my favorite. After we ate, we looked around the restaurant’s gift shop and I noticed they sold containers of the pancake mixes. But it wasn’t until some time later I regretted not buying the sweet potato pancake mix. In order to satisfy my desire to have them again I decided to try making them myself using leftover cooked sweet potatoes. My pancake recipe follows along with my experiment to make sweet potato waffles showing a picture of the waffles. Needless to say both recipes have turned out well after tweaking and I now serve them on a regular basis. Cook sweet potatoes in microwave and as soon as they can be handled, peel and put through a potato ricer or mash well. You will need about one cup of mashed sweet potato for this recipe. The sweet potato can be prepared the evening before and refrigerated. Sift the dry ingredients together into a medium bowl and set aside. Combine riced sweet potato, beaten eggs, milk and butter/oil (I use 1/8 cup each, but you can use all of either one if preferred) in another container. Blend the sweet potato mixture and the flour mixture to make a batter adjusting to get the proper consistency. Using a preheated lightly greased griddle, drop batter by large spoonfuls (I use a big melamine cooking spoon) to make 4 – 5 inch pancakes. Cook until golden brown and when the surface begins to bubble turn and cook the other side until it is golden brown. 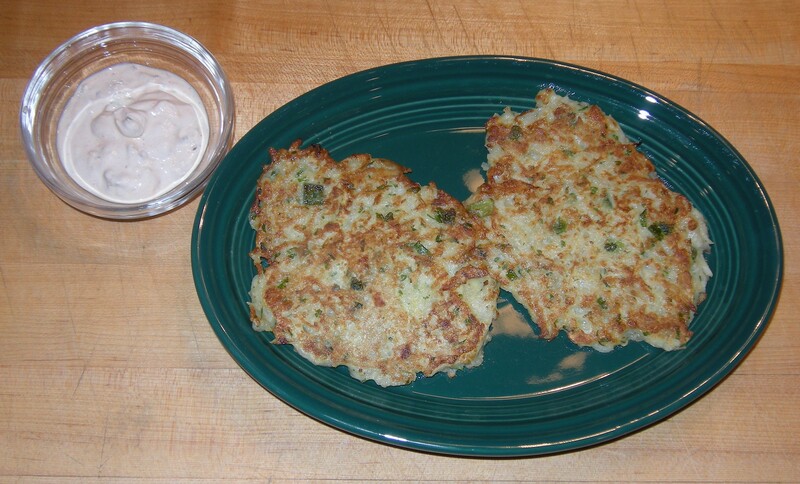 These pancakes go well with bacon or sausage and topped with maple syrup and butter. Blend together the milk, riced sweet potatoes, butter/oil and eggs. Whisk together the dry ingredients and blend them into the wet mixture. Adjust until you have a thick consistency that pours onto the heated waffle iron — you may have to spread it out with a heat resistant spatula so you don’t get so much on it that it overflows too much. Cook until they reach a rich golden brown. Serve with maple syrup or fruit of your choice. Try these sweet potato breakfast recipes and see if you don’t like them too. Originally I planned to highlight this blog with my version of Peachy Pancakes, but my daughter, Annalisa beat me to it with her blog, so here’s a link to her blog so you can read about them from her site. In fact I must credit her husband for this idea since he introduced them to me at their house. http://www.annalisala.com/2011/01/15/peachy-oven-pancake/ I will add to this concept by introducing German Pancake or Dutch Babies which is likely a plain version of the Peachy Pancake. Also along this line I’ll mention another fruit version, the apple pancake, that my sister-in-law made for us when we visited her. In all cases these pancakes are baked in the oven and tend to puff up as they bake. I think one could vary the fruit and make many variations of this recipe. Recently I was watching a television program that my husband taped on the best breakfasts. This show was where I learned about German Pancakes or Dutch Babies. 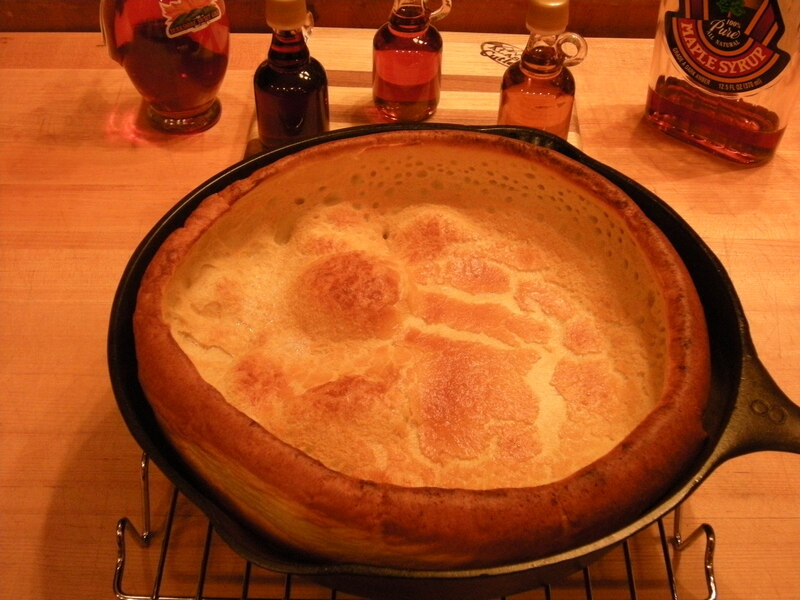 I was so intrigued with the name Dutch Baby that I had to look up a recipe. After reading the recipe, I decided it was actually like the Peachy Pancake without the fruit. So I decided to try making it and had fantastic results. But the first time I forgot to even get a picture, so naturally we had to try it again. The recipe follows with a photo. Preheat oven to 450 degrees. 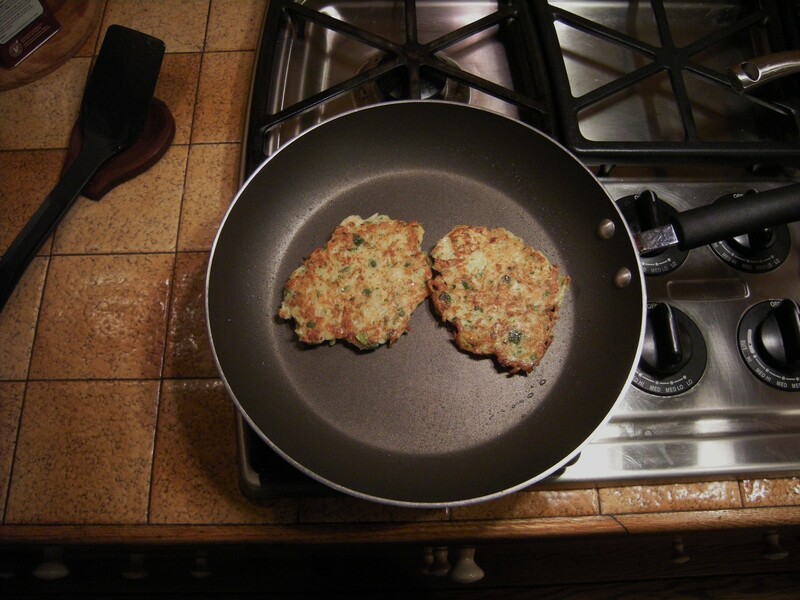 Place an 8″ cast iron skillet rack on a rack in the middle of the oven while you prepare the batter. Beat eggs until light and fluffy, then beat in milk, vanilla, and cinnamon. Blend in flour using a lower speed until it is incorporated, then beat on higher speed until smooth and creamy. Remove skillet from oven and add butter, swirling skillet until it is melted and the bottom and part way up the sides of the pan are coated. Pour batter into the hot buttered pan and put in oven. Bake 20-25 minutes until pancake is fluffy and golden brown. Watch carefully not to burn after 20 minutes as mine was done in just 20 minutes. Remove from oven and serve. Some people dust the pancake with powdered sugar and serve it with maple syrup or jelly or fruit such as strawberries. I will end this post here since I lost the rest of it when I was distracted. Hope everyone who tries these recipes for baked pancakes finds them as tasty as my family.